One of the reasons luxury vinyl tile is the popular choice is that it is the most durable and cost-effective flooring option available. Mimicking the texture and look of natural wood and stone, it is a good-looking, comfortable, and easy to care for floor covering that can easily be laid over most other flooring. When you are looking for a new luxury vinyl tile floor in Rocklin, CA, visit the flooring specialists at Gold River Flooring America to explore and ask questions about their vast catalog of luxury vinyl options. Are you considering tile flooring for your home or business? Look through our impressive collection of porcelain and ceramic tile in our flooring showroom, where we boast a diverse inventory of tile products. 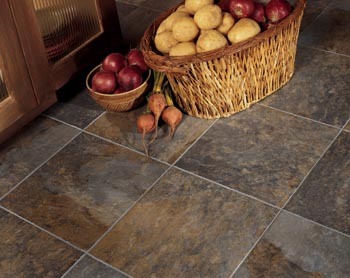 In our catalog, you will find resplendent slate tile, one of the most desirable floor materials available anywhere. We also provide professional tile flooring installation by experienced and skilled installers. Tile is an outstanding choice for those who want to combine attractive aesthetics with ease of care and maintenance. Ceramic tile is stylish, practical, and easy to maintain. The ceramic material is incredibly strong, so it holds up well in busy households. It is tough enough for children and pets to play on without being damaged, scratched, or stained. Ceramic tile is also moisture and liquid resistant, which makes it such a popular choice for all bathroom and kitchen flooring. The pores in the surface of this tiling are so tiny that they don’t easily absorb water or any other liquids that spill on the floor. This means you do not have to worry about exposure to water and moisture causing damage to these floors over time. With minimal upkeep, your ceramic tiling will continue to looks as attractive as the day of your tile floor installation. Porcelain is a hard flooring surface that will resist water, which makes it a great choice for bathrooms, kitchens, and basements, and other areas where moisture levels may be high. However, do not hesitate to use it in other rooms of your house as well, for the elegance of porcelain tile is appropriate for a foyer, the living room, and bedrooms, too. At our flooring store, you will find hundreds of options when choosing the type of porcelain tile you want. From the size and shape to the color and pattern, you can customize the design combination however you wish. With so many different options, you may not know where to start, but choosing the right tile is easy. Once you have made your choice, our flooring experts can take care of your porcelain tile floor installation. Slate is one of the most versatile building materials, often used in residential and commercial construction. Being very dense and durable, it is able to withstand extreme pressure, as well as daily wear and tear. The rugged appearance of slate offers an elegance to many different types of interior décor. Our flooring team can help you choose the right type of slate tile for your home, as well as handle the installation ensuring your new flooring looks flawless. While slate is not always the least expensive flooring option, it is certainly one of the most worthwhile. Not only will you get to enjoy its appearance for many years with very little maintenance, but you will also immediately increase the overall value of your home. If you are not quite ready to commit to slate flooring, you can try out our luxury vinyl tile floor option. Tile flooring must be installed properly to look good and last as long as it should. We recommend that you choose our trained and experienced flooring technicians to install your new tile floors. Our professionals come to your home to install tile flooring properly. We will first perform a free room measuring to ensure we have the right amount of flooring materials for the job. We then use our specialized tools to lay down the tile flooring so that it fits within your home perfectly, ensuring seamless results. Accomplished with the utmost care, our work shows off your new flooring the way you expect it to. We promise that you and your family will enjoy its beauty and ease of maintenance for many years to come. Our tile flooring installation and our flooring come with the best warranties in the industry. If you are not satisfied with the product, simply let us know. Let us know within 30 days of installation, and our professionals will replace your floors with those of equal value. Be sure to ask about our Ultimate Confidence Guarantee™ to find out how you can choose the ideal warranty for your purchase. Contact our flooring team today to learn more about floor tiling options. We proudly service Rocklin, California, and surrounding areas.